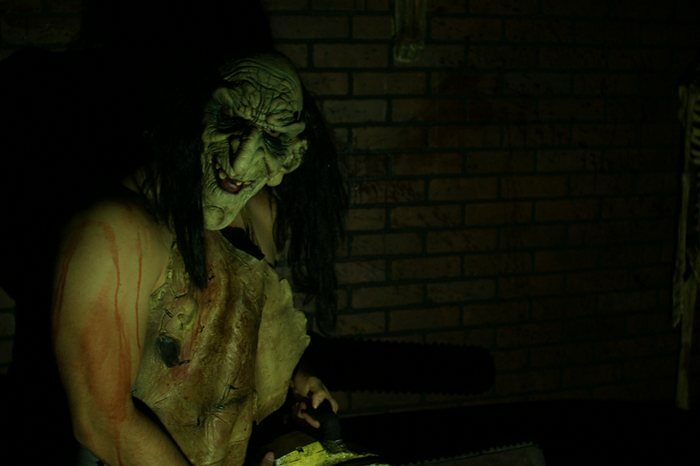 If you and your friends are planning to visit any of the haunted houses this year, then I highly recommend you checkout Terror Dome Houston Haunted House. They will scare you at every corner. The best part is unlike the other haunted houses which were basically a couple hallways and a chainsaw guy at the end. Terror Dome Starts with a chainsaw guy, and it gets even better as you go through. First of all this is not your typical haunted house. I have been to some other haunted houses in Houston, to find after waiting for 3 hours in line, it was nothing more than a couple of dark hallways with people that jump out at you. Terror Dome was more like a maze with something new around each corner to get your heart racing. I was honestly surprised how long it was. It took me about 15 minutes to get through it. I am not going to say names, but it seems like the haunted houses that advertise the most, usually skimped out on the actual decor to make it a great experience. The entire experience at other haunted houses only lasts about 5 minutes. Its almost like Houston Nightclub promoters have gotten into the Haunted house business. With a 1 month season there isn't enough time for the bad word of mouth to stop people from checking out a venue. Promoters in Houston are known for advertising the best show on earth, then you get there to find a high cover, expensive drinks, no parking, long lines, and dress codes that seem to not be applied equally to everyone. My Black Friends know exactly what I am talking about. If you are taking the kids out to the haunted houses this year, don't bother with the ones heavily trying to buy clicks on google or saturate the airwaves with advertising. Just because a company advertises, doesn't mean it sells great products and services. The entrance is outdoors, however once you enter you are definitely indoors. How dark is it in Terror Dome? Its pitch black, you have to use your hands to feel around most places. Any lighting is effects lighting or blacklights. So you can see enough to get around and not trip on anything, but not enough to ruin the mystery. Is it too scary for small children? I wouldn't recommend taking small children to Terror Dome. Unless of course you want to deal with their nightmares for the next month. Also if the grand parents have high blood pressure, you might not want them to enter. Unless of course you have a really sweet life insurance policy on them.